More and more polling about non-policy issues | 2018 Q1 Publicly Released Polls | Jenkins Research Inc.
Twenty-four months ago, the database of public opinion releases that fuels this analysis was started. All this time later, information on 1762 releases has been compiled. Readers are reminded that more than one release might appear on a single survey data collection period. Below are some insights into this quarter’s information. 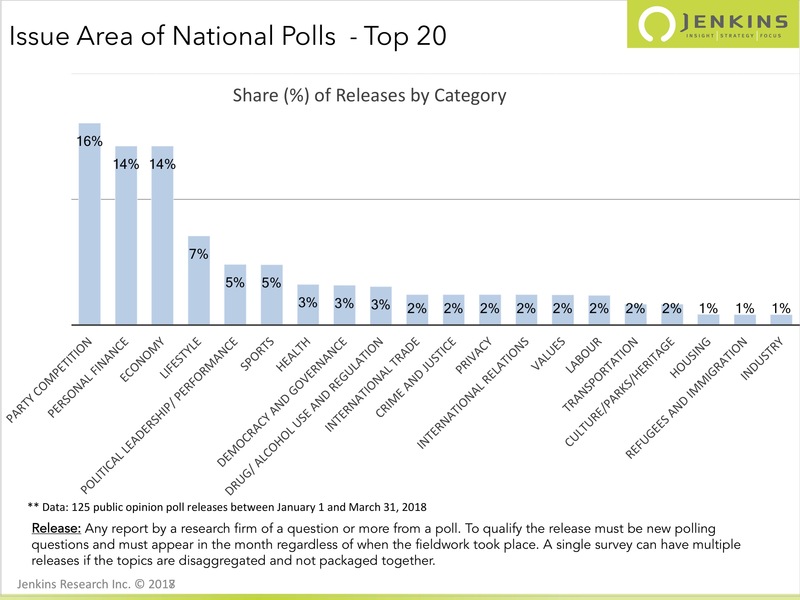 2018 started off in line with 2017 when it comes to the public release of polling data; 191 releases this quarter compared with 199 the previous quarter. This was after Q4 in 2017 fell short compared to the previous year. With a provincial election in Ontario, the Q2 numbers may be on the high side. 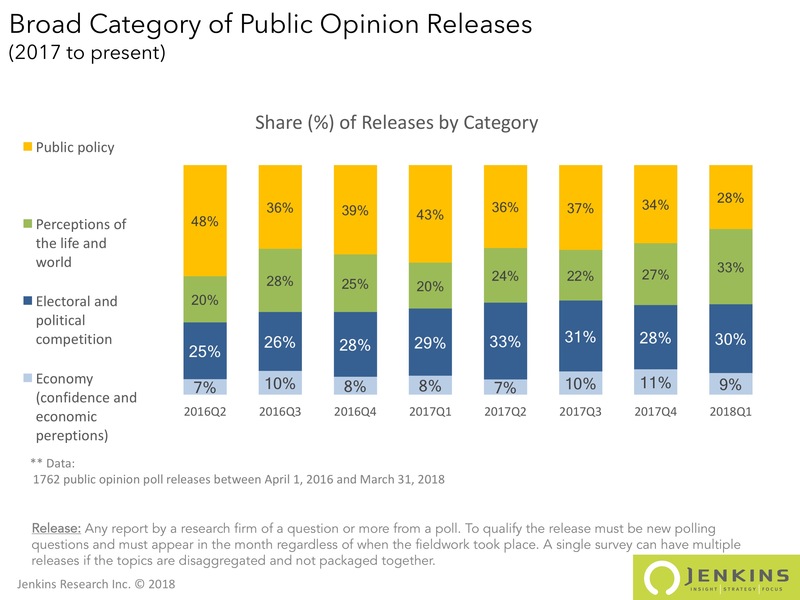 One of the interesting trends over the 8 quarters of data collection is that the share of releases identified as being about public policy has declined. In fact, in Q1, only 28% were about public policy. The share of horserace/ election type polls has been fairly stable as has the share of economic releases. The category that has benefitted the most is the catch-all category, perceptions of life and the world. These releases are categorized as such because they are about various aspects of our life and the release is not raising public policy implications. No surprise, many of these releases are being tied to companies promoting their products. 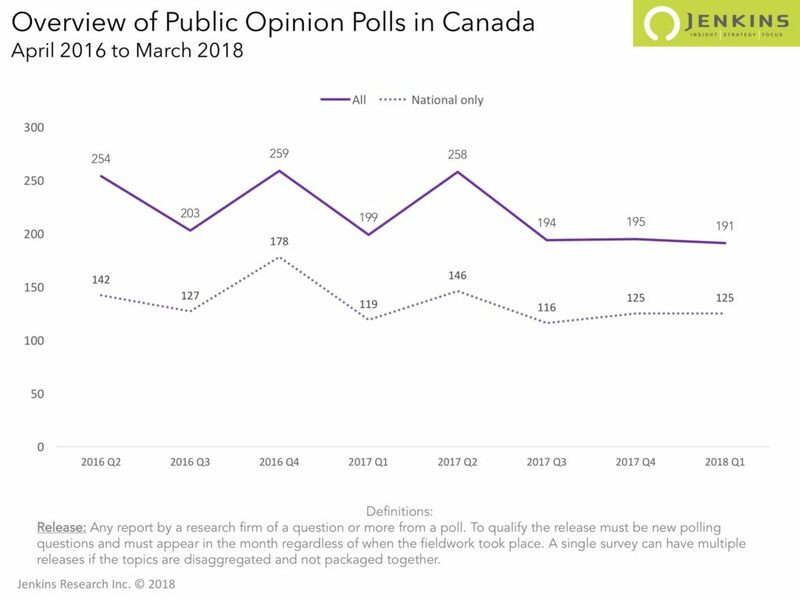 Focusing on national polls offers a useful perspective on polls that all Canadians had a chance to see (though many of these never received any coverage). In Q1 of 2018, 65% of all releases were about a national public opinion poll. Looked at this way, party competition (16%) is not surprisingly the highest polled topic. The surprise, perhaps, is the share (14%) devoted to personal finance and the share on lifestyle (7%). More than 90% of the releases fit within the top 20 shown below. 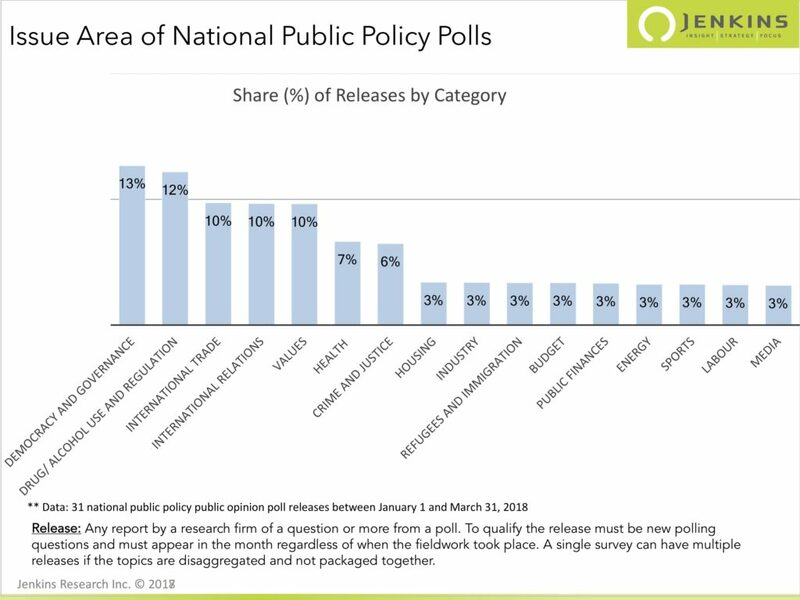 When we focus only on public policy polls asked of a national sample, the top areas were democracy and governance (e.g. attention to politics between elections; civic engagement; trips by parliamentarians), drugs (all of which were about marijuana), international trade (NAFTA) and international relations.